Brian Stuckey started this website around 2009 shortly after he purchased his first Nixie Clock from Jeff Thomas (R.I.P.) He was instantly in love with the antique display technology and became a collector. Since starting this website, things have moved on and he does not have the time to maintain the site any more. I offered to help out because I hated seeing the site stagnate, and so Brian and I made an arrangement that I will take over the daily running of the site to keep it updated and an interesting place to be. 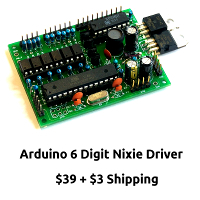 I sincerely hope that I will be able to keep up the high standards and will strive to keep the same values that Brian had when founding the site: that it is an interesting, informative, open place for Nixie and VFD enthusiasts to meet and exchange ideas.